At the Midwest College and University AV Summit, we were able to tour one of the most technology rich 2-year colleges I have seen- Saint Paul College. While the technology in the classrooms was impressive, it was the technology in the technical areas of the college that were truly exciting. In general, 2 year colleges are under-funded and are, therefore, stuck in a cycle where the budget only allows for minimal upgrades over time. Larger technology investments are typically put on hold, indefinitely. Saint Paul College is different. Consistently ranked in the top 10 technical and community colleges in the US, they have found a way to stand out. We toured high-technology sim labs for their nursing and medical sciences programs with observation rooms and lecture capture equipment tailored to help students and faculty review the information they need, effectively and efficiently. We tried out divisible flex-rooms with installed wireless presentation products for content sharing. But, one of the unique spaces that made an impression on me was the welding shop. 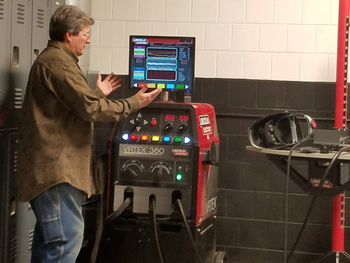 Located in the basement, they teach four or five (or more) different welding techniques in this large and well-outfitted area. Available to students are every type of machine and material you can imagine for this course of study. In general, you don’t expect to find cutting edge technology in a welding shop. BUT Saint Paul College is different (I may have mentioned that). They have purchased a VR welding machine. YUP! Virtual Reality welding machine. Many schools I tour are still evaluating how VR can be used successfully. Saint Paul College has been using it for years. Why Teach Welding Through VR? This $40k machine has paid for itself years ago. I share this because I encourage colleges with tight budgets to reach out to the team at St. Paul College and discuss how they started down this path. How did they secure the resources to begin building a top 10 community college with technology that many 4-year schools have yet to adopt? I think they could have used more power solutions, though. If you’d like more info on the Midwest College and University AV Summit, click here. And, if you would like to share some example of VR in use at your schools, post in the comments!